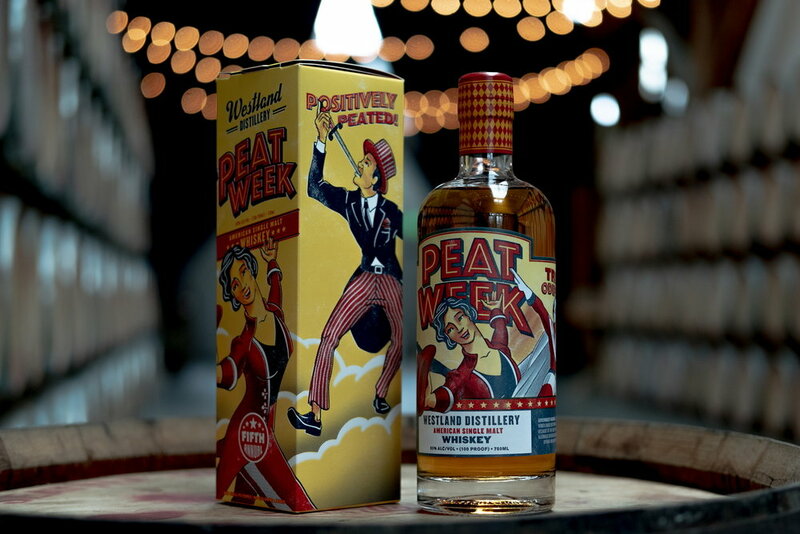 Westland has a peat festival every year where they release a special, limited edition peated whisky focused more heavily on peat than their standard Westland Peated bottling. It is based on a variety of casks, and changes year to year. Westland released this limited edition, created from peated Scottish barley, in three different labels, at cask strength of 54.4%, representing the best of big, peated whisky from Westland. It's a blend of distillate 36-56 months old, and a blend of two first-fill ex-bourbon casks and five new american oak barrels. 1500 bottles produced. Big and smoky – with lots of dry peat, charcoal, vanilla, and a bit funky. Caramel, smoke, banana chips, hay, roasted stem tea, almonds, dark chocolate, beets – leading into a caramel-laden, smoky, oaky, and rich palate including many hints of dried tropical fruit. Pear, The finish has lots of cacao, fruit, caramel, and spices which emerge – clove and white pepper. I quite like the proof. It’s flavorful and rich without being overpowering. I quite like this, but it’s hard to beat their wonderful single malt. Value: Low. It isn’t far from “average”. This is another peat week bottling, made from 5 casks - 2 first fill ex-bourbon, 2 ex-westland American oak, and 1 new american oak (Westland’s cooper’s reserve cask). It is matured between 36 and 63 months. The malt is from Bairds in Scotland, peated to 55 PPM. The nose is peaty, but also very fruity – peach, dried apricot, cranberry jelly – this, however, is more like an Islay whisky than the previous batch I tried. It has a very nice creaminess to the nose, with caramel and maple growing with time. The nose is very nicely balanced between the peat, earthiness, oak, and fruitiness. The mouthfeel is terrific. The palate is sharp and ashy, but then the fruitiness and roasted grain kicks in, in a very Westland-like fashion. We also have custard, rich and rooty wet earth, macadamias, hazelnuts, cranberry chutney, whole grain porridge, toasted oats – and of course sharp smoke. The finish continues with nuttiness, rich grain character, peat, ripe pear, and light medicinal notes. Very nice! This edition stands out to me much more than the previous one. It is amazing how much Westland malt character is brought in through the Westland casks. Delicious! Value: Average. $100 for this competes fairly well with the standard for something of this quality.